U.S. automakers are producing an ever increasing line-up of more efficient vehicles. However, efficiency measures in the auto industry extend beyond the vehicles they produce. American car companies must compete with more than 36 new hybrid and electric vehicles (EVs) that have been or will be launched in 2013. Growing demand for highly efficient vehicles has compelled almost every brand to get into the EV market, which gives consumers an ever expanding list of vehicles to choose from. In addition to expanded product lines, innovative sustainability measures are being adopted by automakers. As explained by Green Car Reports, the major automakers are doing more on the sustainability front when it comes to their EV production lines. They are reducing their waste, increasing their use of solar power while reducing their energy usage. Automotive brands are increasingly seeing value in greening their operations and products as evidenced by Interbrand’s 2013 Best Global Green Brands ranking, which counted four automotive brands in the top five spots. The ranking evaluates companies based on their environmental performance and the public’s perception of their green credentials. A Mintel study indicated that sales of hybrids and EVs were up 73 percent in 2012. They forecasted that the number of hybrid and EVs will reach 535,000 units by the end of 2013, which represents a 14 percent increase in sales over 2012. By 2017, Mintel predicts that sales of hybrids and EVs will reach 850,000 units, representing five percent of the total US car market. According to forecasts from Pike research, more than 210,000 plug-in electric vehicles (PEVs) will be sold globally in 2013. By the end of 2013, about 400,000 PEVs will be on the road globally. They further predicted improved battery performance including greater reliability and charge acceptance from regenerative braking. Edmunds.com projected that at least 43 new hybrids, PEVs, EVs, diesels and fuel cell electric vehicles are planned for introduction in the U.S. by the 2015 model year. Aggressive national fuel economy standards for model years 2012 to 2025 have helped push automakers to provide more efficient vehicles. Declining price points from companies like GM and Nissan are also a factor driving the rapid adoption of EVs. The growth of charging station infrastructure is another factor supporting growth. A late 2012 report released by Lux Research forecasts that the market for electric vehicle charging stations will rise from $140 million in 2012 to $1.15 billion by 2020. The market for charging equipment is expected to grow from about 120,000 units in 2012 to 1.3 million in 2020. Here is a review of some fuel efficient vehicles along with the sustainability efforts of U.S. automakers General Motors, Ford and Tesla. These car companies are producing more efficient vehicles as well as exploring some innovative sustainability initiatives. Just a couple of years after being on the brink of oblivion, GM was awarded the Top Automotive Innovator as ranked by The Patent Board. All together, GM was granted 1,123 U.S. patents in 2011. In July, Environmental Leader reported that General Motors has partnered with Honda to develop fuel-cell vehicles and infrastructure. This partnership makes sense given that the companies are first and second on the Clean Energy Patent Growth Index. When added together, GM and Honda have filed more than 1,200 fuel cell patents between 2002 and 2012. GM has also garnered a lot of experience with Project Driveway, a program which was launched in 2007. Through the project, GM has amassed more than 3 million miles of real-world driving experience with a fleet of 119 hydrogen-powered vehicles, which is more than any other automaker. As reported by Environmental Leader, General Motors plans to invest more than $331 million to produce more fuel-efficient engines and transmissions. This includes the Ecotec engine which offers improved fuel economy, better performance and reduced carbon dioxide emissions. It also includes an eight-speed automatic transmission which will assist in improved fuel economy and performance. GM’s investments came a month after GM CEO and chairman Dan Akerson announced the company will save 12 billion gallons of fuel over the life of the vehicles it builds between 2011 and 2017. The company has also committed to achieving a 20 percent reduction per vehicle in global CO2 footprint by 2020. In 2012, Solar Energy Industries Association said that GM uses more solar power than any other automaker in the U.S. The company also ranks No. 13 of the top 20 solar-powered companies in the U.S. In 2011, GM committed to doubling its global solar output to 60 megawatts by 2014, and to increase renewable energy use to 125MW by 2020. In 2012, GM announced its plan to turn more than half of its manufacturing plants into landfill-free facilities. With the aim of helping other companies do the same, GM shared its waste reduction blueprint called “The Business Case for Zero Waste”. The automaker recycles 90 percent of its worldwide manufacturing waste and has 102 landfill-free facilities. On its way to achieving a zero-waste status, the company has managed to generate billions of dollars of revenue. The Volt is GM’s green flagship. This vehicle can operate up to 40 miles on its electrical charge before switching to a gasoline powered engine. 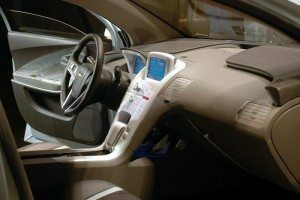 According to the EPA, the Chevy Volt has a rating of 93 MPGe (MPGe, or miles per gallon Equivalent is a measure of how far the car can travel electrically on battery energy equivalent to that contained in 1 gallon of gasoline) while running purely on electricity, and 37 MPG in so-called “charge-sustaining” mode. The Volt is the most widely sold car in its class in the U.S. In 2013, Ford Motor Co. announced that “eco-consciousness is no longer a niche value; it’s a way of life.” In 2012, Ford announced plans to cut water use at its European plants by 30 per cent by 2017, and to send 70 percent less waste to landfills. In all, it is estimated that Ford will prevent 5.5 billion tons of waste from being dumped in landfill sites and save 1.3 billion liters of water. According to Interbrand’s 2013 Best Global Green Brands ranking, Ford Motor Co. came in second. Their Taurus has a 2.0-liter EcoBoost engine that gets 32 mpg, it’s the vehicle which was EPA certified as the best-in-class large sedan for city and highway fuel economy. In 2012, the company launched five electrified vehicles: Focus Electric (MPGe 105), which went into production in 2011, C-MAX Hybrid (43 MPG), C-MAX Energi plug-in hybrid (MPGe 100), the Fusion Hybrid (MPG 47) and the Fusion Energi plug-in hybrid (MPGe 100). In 2012, Ford announced some ambitious plans to increase their EV production capacity. They said they want to double their battery-testing capabilities by the end of this year. The company is investing $135 million aimed at speeding up the development of its next generation of electrified vehicles by at least 25 percent. Ford says it will reduce the costs of its hybrid system by 30 percent over previous generations. Their goal is to triple electrified vehicle production capacity by 2013 and offer more choices to consumers. Ford is also getting involved with hydrogen fuel cell vehicles. At the beginning of 2013, the Detroit Free Press reported that Ford had joined Nissan and Daimler to develop affordable fuel cell electric vehicles with the goal of a 2017 launch. Ford has also adopted some innovative technological approaches to being more environmentally friendly. Ford launched a $50,000 challenge for software developers to create mobile or web-based apps to help consumers better understand and improve their personal fuel-economy performance data. Ford is also exploring the ways in which cloud-based technology called the EVOS concept car can improve upon and personalize vehicle performance. Ford is researching the ways in which the Nokia Location Platform can optimize hybrid powertrain efficiency by automatically regulating a car’s powertrain as it travels. Ford is also behind an innovative program that addresses enegy use. At the Consumer Electronics Show in Las Vegas, Ford announced the launch of MyEnergi Lifestyle. This product helps people to use energy more efficiently, it also connects plug-in vehicles and energy-smart appliances to the same database, to produce a measure of overall household energy efficiency. Another intiative from Ford involves the expansion of its low solvent low VOC, 3-Wet paint process which the company claims is reducing CO2 emissions between 15 and 25 percent at eight of their plants. By the end of 2013, Ford will have implemented the technology in 12 plants. The automaker says it will expand to additional facilities worldwide over the next four years. The process saves electricity from the blowers that circulate massive volumes of air through paint booths, and reduces Ford’s use of natural gas needed to heat the air and ovens. Ford also reduced the average amount of water used to make each vehicle by 8.5 percent between 2011 and 2012, putting the company more than halfway toward its goal of using an average of 4 cubic meters per vehicle globally by 2015. Tesla Motors is the pioneering California-based electric car company which is pursuing the goal of accelerating the world’s transition to sustainable transport with a full range of increasingly affordable electric cars. Tesla designs and manufactures EVs, as well as EV powertrain components for partners such as Toyota and Mercedes. In addition to producing very efficient electric vehicles, a company press release indicated that the Tesla Model S has achieved unparalleled safety ratings. Independent testing by the National Highway Traffic Safety Administration (NHTSA) has awarded the Tesla Model S a 5-star safety rating on every subcategory without exception. This is a rare distinction as only one percent of all cars get an across the board 5 star rating. The Model S earned an unprecedented new combined record safety rating of 5.4 stars. Tesla Motors is an early adopter which has schooled the EV industry in the U.S. and around the world. In 2006, Tesla was named a recipient of the Global Green USA Product/Industrial Design Award for its work in developing the Tesla Roadster. Tesla has even incorporated a novel approach to sustainability into their production facilities. Rather than build new facilities, Tesla Motors motors have refurbished older factories. Overall, Tesla is widely recognized for its excellent industry leading sustainability strategy. According to Elon Musk, the CEO of both Tesla Motors and SpaceX, as well as the Chairman of SolarCity, all forms of transportation are going to be electric. Efficiency is driving the market for this new generation of vehicles which are far more efficient than gasoline and diesel power. Advances in electric and hydrogen vehicles are ushering in a new era that will bring an end to the environmentally destructive internal combustion engine. More sustainable practices, collaboration, technology and a new generation of vehicles are reducing the footprint of the automotive industry. Highly efficient electric and hydrogen vehicles are combining with sustainable automotive initiatives to forge a clean and green future in the U.S. and around the world. If the goal is a short-term and significant reduction of CO2 from auto’s, and in carbon footprint, and from power generation, with current technology, the PEHV offers this, as a transition to EV’s in a decade or two. However this can only be a mass market changer when it costs the same as a gasoline equivalent. Thus a Chevy Volt, or a Tesla, are just toes in the water, reaching but niche/riche markets. What about the Asian markets, growing to 60m auto’s per year? $50,000 EV’s, HEV’s or PHEV’s are no solution, until they are $20,000. The way forward is cheaper battery technology (One in the pipeline is Envia) a cheaper electric motor and transmission ( bravo Protean Electric), and a much cheaper ranger-extender gasoline engine. The CITS engine will cost half of the current 4 stroke engines per kW/HP. Please see http://www.citsengine.com.au. Will someone please come to the party, before the Chinese take the baton ? Thanks for the comment Basil, I entirely agree with your comments about hybrids as a bridge as well as your statements about China and the price points of both gas and EVs. As promised by former energy secretary Chu we should see battery efficiency increase and prices drop. Although I want to be hopeful, if the past is any indication of the future, we have reason to be concerned about the strategic focus of the American auto industry. As far as meeting the demand for inexpensive EVs in Asia, there are a number of products that do just that. I will explore the link you provided in greater depth, however, it is my view that the combustion engine is nearing the end of its life cycle. Irish Inventor Chris Adair has produced a very simple Water to Hydrogen unit which uses just 0.35 of an amp to produce a tiny bubble of Hydrogen every 10 seconds. Fed in the air inlet the hydrogen reduces emissions by 50 to 80%, vehicles with non-functioning catalytic converters easily pass emission tests. Fuel efficiencyis increased 10 to 30%, the 380mls of solution can last 30,000 miles. Thanks for the comment David. Hydrogen fuel cells are undeniably an important part of the automotive future and I will investigate Chris Adair Water to Hydrogen unit you mention.